← Jubala Village Coffee Turns Three! I know this week’s picks are coming out a little sooner than usual, but it is going to be a busy week and I wanted to share the news of some truly fantastic stuff coming up later this week. Of course today also marks the launch of NC Beer Month, starting off with “Casks on Fools” at Crank Arm Brewery today (4/1) at 3pm. To learn more bout local beer related activities in April visit my recent post here. 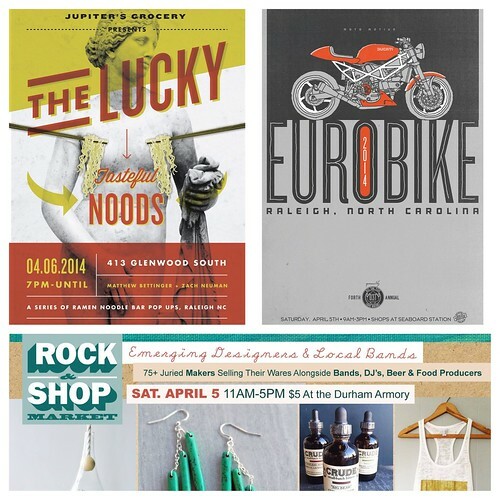 This weeks picks kick off with the Durham Bulls season opener on Thursday followed by a weekend featuring art, film, motorbikes, and a PopUp Ramen noodle bar! See all the details below and a great week! The curtain will be lifted on the “new” Durham Bulls Athletic Park on Thursday, April 3 at 6:05pm when 605 West Apartments presents Opening Day. Gates open at 5:00pm for the game against division rival Gwinnett, giving fans plenty of time to enjoy pregame festivities that will feature a special entrance by Wool E. Bull, christening of new stadium video displays, full roster introductions, and National Anthem performed by the Duke Pitchforks. First Friday is a free self-guided tour of downtown’s cutting edge cultural hot spots. Local art galleries, art studios, alternative art venues, and museums stay open late the first Friday of every month to welcome thousands of art-seeking enthusiasts downtown. The event runs from 6 pm-9 pm, but some venue hours may vary. While downtown I also suggest stopping by the new Raleigh Wine Authorities to enjoy a glass of wine in their front sidewalk seating area to welcome the warmer weather that has finally arrived. Celebrate the grand opening of Gregario’s in Durham Friday 6-8 p.m.! This after-work event will include free food, festive music and $2 drink specials. Enjoy the beautiful outdoor patio seating just in time for spring! Come out for a Food Truck Round Up at Durham Central Park and a FREE outdoor screening of one of the Full Frame Festival’s documentaries. Food trucks start at 5:30 and fim begins at 8:30. Food trucks scheduled include Iced Cupcakes, The Parlour, Pie Pushers, Sympathy for the Deli, Triangle Raw Foods, CJ’s Street Food. From 9 AM to 3 PM, the Shops at Seaboard Station will welcome the fourth-annual Raleigh Eurobike, a celebration of the two-wheeled lifestyle and the machines that have become synonymous with style, performance and speed. From exotic Italians to the finest examples of German engineering to the British motorbikes that inspired a café racer revolution, Eurobike Raleigh will showcase some of the most exciting European motorcycles in central North Carolina. Duke Gardens at Annual Spring Plant Sale is this Saturday from 8 a.m.-noon. You’ll find an array of plants ideal for this region, including Duke Gardens plants, trees, shrubs, vines, bulbs, decorative plant pots and lots of fantastic plants from specialty vendors. And you can get free gardening advice from our staff and master gardeners. Two foodie friends have teamed up to create The Lucky, a pop-up Japanese noodle restaurant. They will transform Cafe Helios for one night only into a popup ramen restaurant to serve delicious ramen, in the style of the Tokyo noodle bar. Sunday April 6th starting 7pm until the noodles run out! Part of Raleigh’s 10-day Oaks & Spokes Bicycling Festival! Registration opens at 1pm with crafts and mingling on the streets of City Market. Riders take to the streets in full fashion promptly at 2. We recommend laying out your duds and doing your nails the night before. To thoroughly enjoy the day, you’ll need to follow these simple guidelines: Bring $10 (cash only) to benefit Oaks and Spokes programming. Each participant of will get 2 drink tickets. Pittsboro’s First Sunday is an artisan market featuring handmade crafts, music, and food every first Sunday of the month from March through December. Join us from 12-4 p.m. in Pittsboro’s historic downtown. Picture of the Week – Wafflegato! Earlier this week I shared a post about Jubala Village Coffee celebrating their birthday by offering some special menu items this week. I made good on my promise and stopped by this morning for the famous Wafflegato. 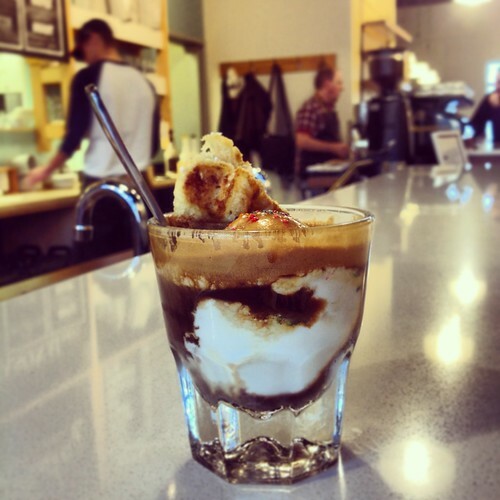 This is a shot of espresso poured over a scoop of vanilla ice cream with a small wedge of waffle added to the mix. It is a delicious treat and it is my picture of the week! They will be serving this Tuesday only as part of their “Re-tweet” Tuesday special!